Use A Teleconverter Or Crop The Image? You’re out searching for wildlife – your camera in hand – when you spot some critter you’ve always wanted to bag off in the distance. Sadly, you know that your lens is just not going to be quite long enough to get the shot you want on its own. So, here’s the question – what’s going to give you the best-looking photo, slapping on a teleconverter or just cropping the non-teleconverter image to the same size back home on your computer? Well, that’s a good question and one that comes up on a regular basis, both on internet forums and in the minds of photographers faced with the situation in the field. So, which way gives better results? Well, I decided to do a few tests that will (hopefully) put that question to bed. 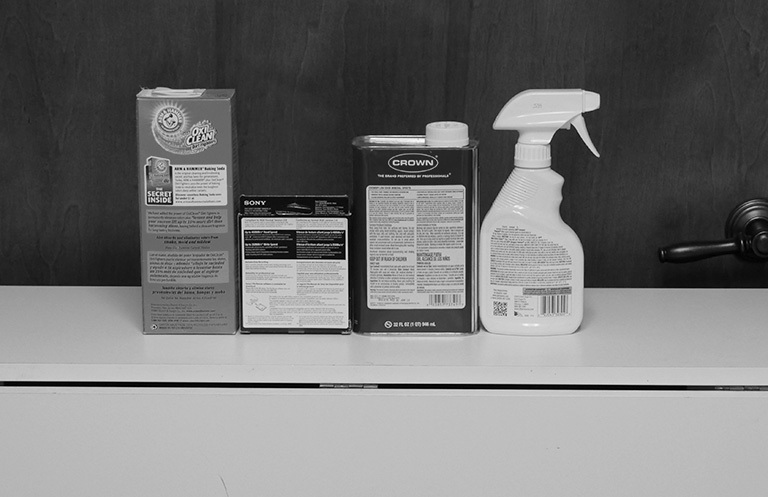 For this test, I used the Nikon 300PF attached to a Nikon D810, D5, and D500. I choose the 300PF because it takes a teleconverter very well and I think it’s typical of what we would see with most quality lenses and 1.4 TCs. Since the cropped shots are lower resolution, I had to downsize the teleconverter shots so we could compare. 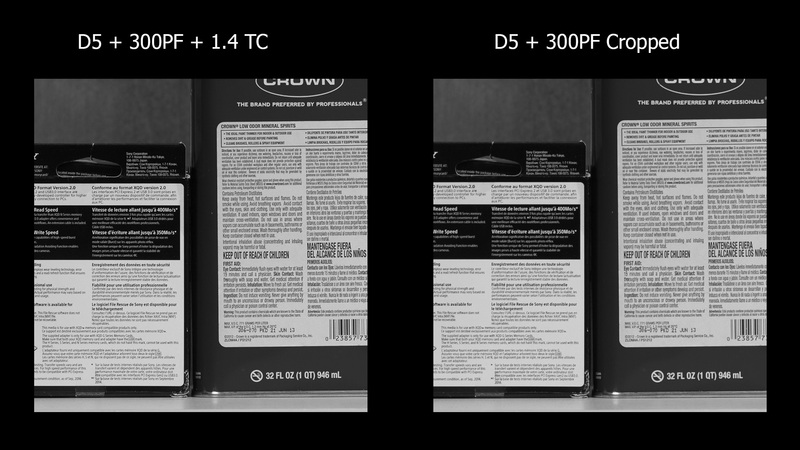 Also, note that I cropped to the same size as the teleconverter – a 1.4X crop, not the 1.5X DX or 1.6X APS-C crop. I currently only use the 1.4 TC, so I can’t compare other TCs. Also, be sure to click the images below for a full-size version (they will open in a new tab). NOTE – when the image opens in a new tab, you may have to click it one more time for the full-size image. First, we have the D5. As you can see, the teleconverter shot has a lot more detail so a TC is definitely the way to go here. 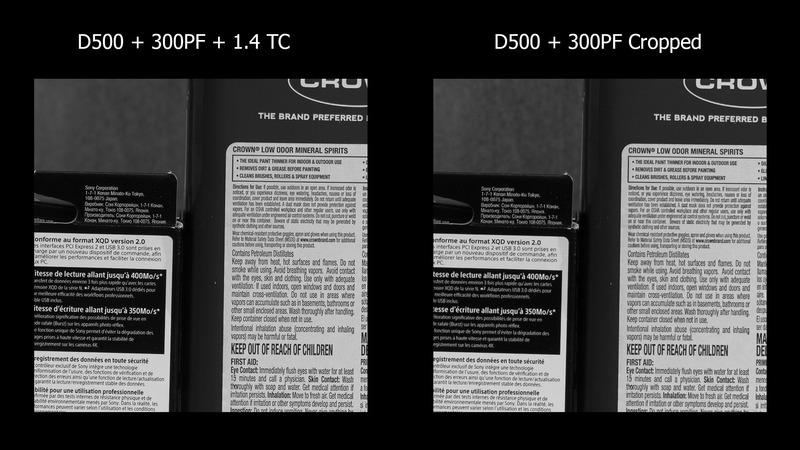 Finally, we have the D500, which is a crop camera to begin with. 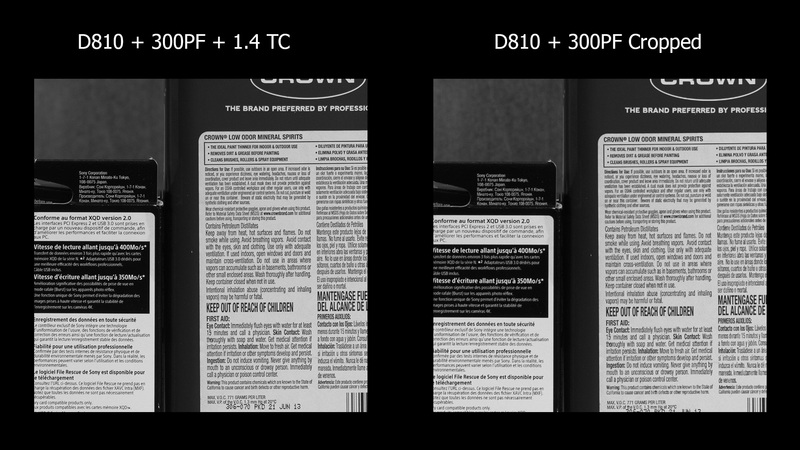 As you can see, similar results to what we saw with the D810. So, at least ostensibly, the bottom line here looks pretty simple when it comes to optical quality. When faced with a scenario where you have the choice of using a teleconverter or cropping, it would seem that your are generally better off using the teleconverter. In each and every test above, the overall amount of detail captured was greater with the teleconverter attached than not (to varying degrees). And in my experience this tends to hold true when dealing with good optics and teleconverters. 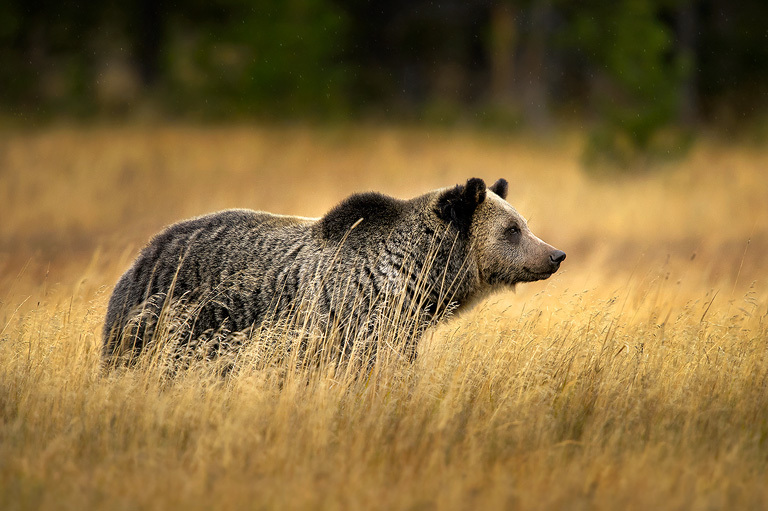 The grizzly shot below was with my 600mm and 1.4 teleconverter on a D4. I am very happy with the level of detail. Keep in mind that not all combinations are necessarily going to behave this way. There are a ton of variables at play here and there’s really no way to account for every one of them. For instance, the 300PF is perfectly happy with a teleconverter strapped on, but not all lenses swing that way. Some lenses are better at taking a teleconverter; others see quality diminished to such an extent that cropping can actually be the better option. (My 200-400 was like that, it never liked my 1.4TC, although others have reported better results with that combo). Another variable is the teleconverter itself. I’m using the Nikon 1.4TC III – one of the best teleconverters on the market. So, using a lesser optic may tighten the gap. So, this isn’t as cut and dry as we’d like it to be. However, I can give you this guideline. Over the years, I’ve found that big glass like the 200 F2, 300 2.8, 400 2.8, 500 F4, 600F4, etc can all take a teleconverter without too much complaining, especially those TCs of the 1.4 variety. When using those lenses, I generally tend to favor using the TC instead of cropping. The image below was captured with the 300 PF and 1.4TC E III. Sharp as you’d ever want. Of course, that said, other limitations come into play when using a teleconverter that you really need to consider. The first and most obvious issue with a teleconverter is that it costs you anywhere from 1 -2 stops in ISO (1 stop in the case of a 1.4TC, 2 stops in the case of a 2X). So, it’s a penalty that you’ll need to consider, especially if the light is getting low. If adding a teleconverter would drop your shutter speed too much (and you’re not willing to go higher with ISO), it’s possible you’d be better off just cropping. After all, I’d prefer a cropped image that was sharp to a full frame image that was not. Many shooters don’t realize this, but the simple fact is your AF sensors won’t work as well with a teleconverter attached. From an overall standpoint, the more light getting through your lens, the faster and more reliable those AF sensors are across the board. So, an F2.8 lens will have better AF performance than an F4 lens which is better than an F5.6, etc. Besides, not all of your AF sensors are created equal. In many cameras, when you drop your maximum lens opening to something slower than F4, some or even all of your cross sensors revert to line sensors. This can make it harder to get an AF lock than without the teleconverter attached. Additionally, and again, depending on the camera and what effective F/Stop you end up with, some of your AF sensors may not work reliably at all. For example, Nikon likes to boast about how their cameras can focus down to F8. However, that’s not for all the AF sensors. In fact, on the D5 / D500, only 15 of the 153 AF sensors support focusing at F8. So, if you add a teleconverter and find you just can’t get an AF lock, then maybe cropping is the better option. (Hint – if you ever have a tough time getting an AF lock, try switching to the center AF point – it’s always the most sensitive). Finally, using a teleconverter will tend to lower the contrast in your images when compared to images taken without one. However, it goes deeper than just the final image. This reduced contrast can also affect your autofocus since your camera uses areas of contrast to achieve focus. I also find teleconverters seem to make the lens more sensitive to things like heat and atmospheric distortion than when I use just the naked lens. So, there you go. Not completely cut and dry however I can tell you what I do. As I hinted above, if I’m in a situation that comes down to a cropping or using a teleconverter, the vast majority of the time I’ll put on the teleconverter – with one exception. If I’m shooting full frame and happen to have my D500 (or another similar crop body) with me, I’ll switch to that instead. It will give me better overall image quality assuming the full frame camera is close in resolution – and I don’t have any of the teleconverter downsides mentioned above. I find that many people like to think of a teleconverter as a way to pull really distant subjects into view – and then crop them heavily later on in post. However, that tends to lead to disappointment since the lens with the teleconverter isn’t as sharp as the lens without the TC attached. Plus, when you have an animal at the kind of distance that requires both a teleconverter and a heavy crop, the air itself can start to soften your image (heat haze, atmospheric distortion etc). 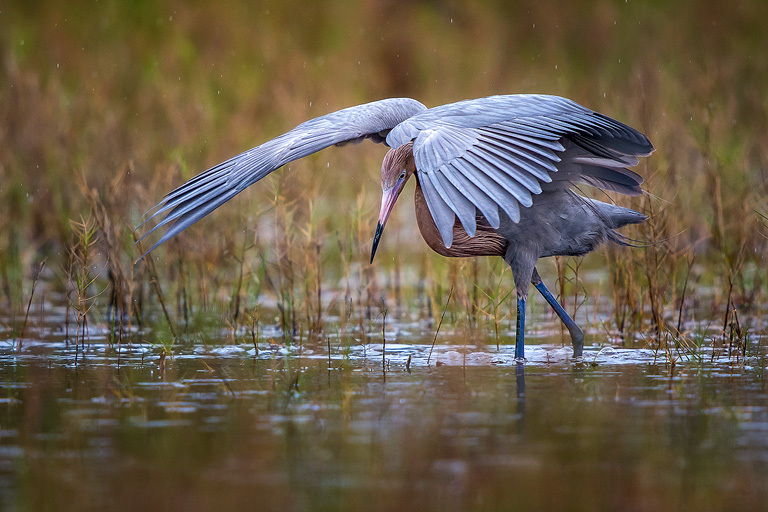 Oh, and what about that Reddish Egret at the beginning of this article? Was it a mistake to crop instead of using a teleconverter (since the TC image would have had more detail)? I don’t think so. I had low light with rain falling and the egret was dashing all over the place. So, I needed both shutter speed and AF speed. In the end, there’s never an easy answer – you have to keep a variety of techniques in mind and use what works best for the scene at hand. This entry was posted in Techniques, Using Your Gear, Wildlife. really amazing tutorials, I love it,thanks for sharing!! 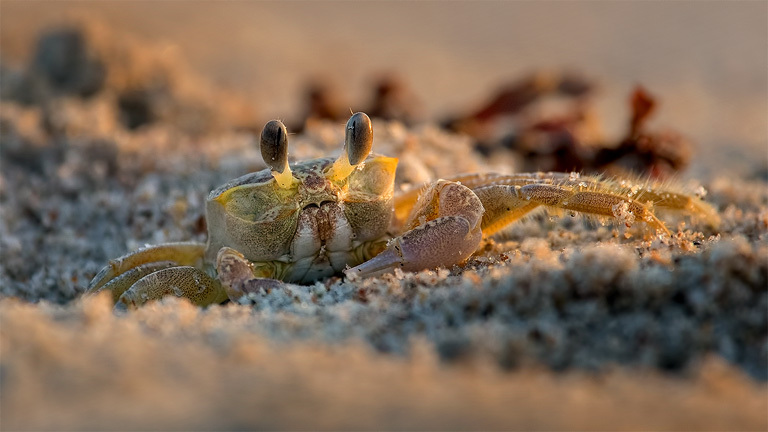 Awesome tips for the teleconverter crop image.Thank you for share your tutorials. I have a D7100 and a 1.4X TC. Since the D7100 offers a 1.3x crop mode which does not introduce “extra glass” or impact f-stop by 1 stop, would it not be better to use the crop mode instead of the TC? And yet another excellent evaluation! Thank you and keep them coming! Very good the post and posting the blog.Valuable and excellent post about photography and image editing.lots of great information and ideas. I just would like to say thanks for your great efforts. Looking forward to reading more. Steve, I just purchased both of your books so if my question is answered there, just let me know. I have the D810 and the D500. Using the same lens, Tam 150-600 G2, if I crop the D810 to match D500 (no TC) should I expect same image quality? 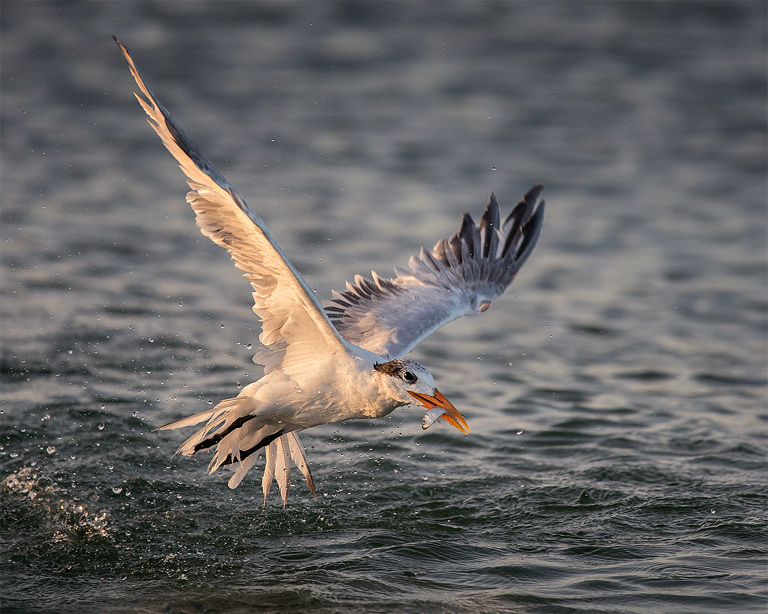 I love the reach and focus of D500 and I love the mg pxl and dynamic range of the D810. Your thoughts? Thanks Richard. Hope you will share more post. I think the photographer is a wildlife lover, for this reason he can take the nice shoot of this pictures. 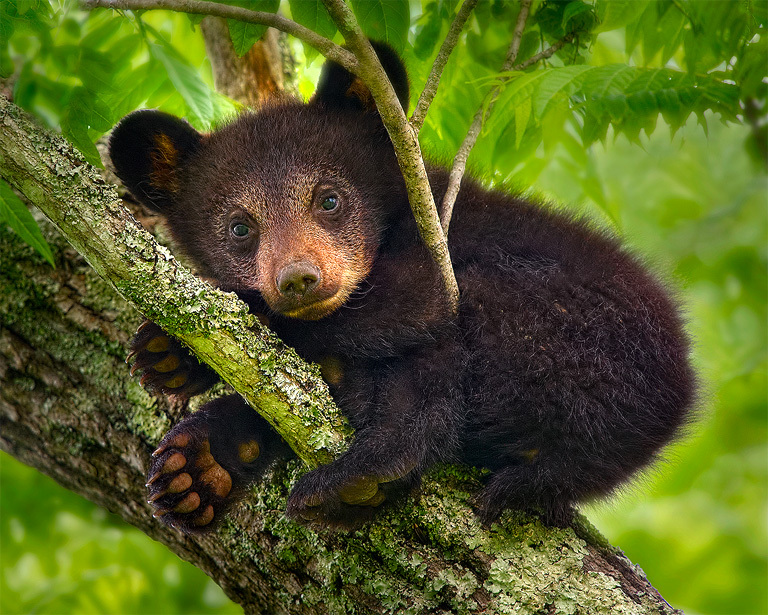 It’s beautiful photo photo for wildlife and nature. Just beautiful to see this post and informative also feeling glad after seeing your nice posting . Keep continue sharing such post . You are well-done for sharing . Keep up it . (I pressed enter by mistake before I finished my previous comment 🙂 I print big panoramas like 10 feet wide. Will I loose too much detail with 1.7x TC considering I can add contrast and detail to some extent in post processing. Mind blowing article. Gather lot of information from your article. Hope it will help me to enrich me. Thanks for sharing the awesome post. I have to say, Steve has an excellent ability to make the complicated simple and easy to understand. I recently purchased “Secrets To The Nikon Auto Focus System” and it’s the best and most detailed step by step instructional info I have read. I truly enjoy all your work. I would also love to purchase a book / video (Video preferred) on your wildlife editing tips. Your photos have such an amazing vibrancy to them. Even though I’m positive they are excellent captures even before you do any editing! Hi Steve Perry. It is an outstanding post.i am also like bird photography. Hi Steve Perry. I was reading your post carefully. It is an excellent post. And I must say that your photo collection is very good. Which camera have you used for this? Steve, just joined the forum and to see you article first,very informative. I normally use a D200 and the D810 with swapping lenses when safe mostly 70-200F2.8, 24-120F4, 18/24-300 lenses.Can you post some ideas on the upcoming solar eclipse. Mahalo. Steve! It is really outstanding! Could you please share a video on this useful article. Thanks in advance! Steve: I’m currently shooting BIF with a D7200. Is there any difference in image quality shooting in DX mode and cropping in post as opposed to shooting in 1.3 crop mode? Thanks. If you’re just cropping to the same 1.3X crop at you computer, then there is no difference in quality. However, you will get a little more space on your memory cards and your buffer won’t fill as fast. Now, if you can fill the frame without the crop vs. stepping back to fill the frame with the 1.3X crop, then there is a difference. My advice is to only use the 1.3X crop when you would have to crop the image to that size anyway. Hi Steve, I read your e-book. Thoroughly enjoyed it. I have a Nikon D-750 and several Nikon lens. Nikon 105 Macro, Nikon 18-120, Nikon 12-24, Nikon 24-120. I also have a Sigma 120-400 Zoom. I was looking to buy the Nikon 200-500 zoom. I shoot birds, otters, and wildlife. What are your recommendations for a zoom lens? Another question what lens of the ones I listed above would you use to take family photos. I thoroughly enjoy all your videos. Thank you and Merry Christmas. Thanks 🙂 For what you describe, the 200-500 zoom would be the way to go for sure. It’s a really good range for most wildlife. For family portraits, the 24-120 would be my choice. Sorry Steve. The question is for, you not Mike! My experience with micro four thirds is very limited, so I can’t really give you an answer that would be much more than a guess. My gut tells me the larger sensor would yield better results, but I can’t say for sure. There does come a point of diminishing returns with the smaller sensors. Plus, I’m not sure on the quality of the 100-400 you mention compared with a typical 300 F4. Sorry I can’t be of more help on this one. Interesting article and conclusions. I’ve found photography is always about some sort of compromise and the area of TC’s is always a subject of debate. It also seems that every new generation of camera gear changes the playing field. I love the shots that you used in your article and video, will be buying your e-book shortly! I am going to Africa and will be shooting from a “jeep” type vehicle most of the time. At 72, I cannot hand hold my 500 f4 anymore. Will my 80-400 with and without a 1.4 be acceptable ? The jeep and other photographers will not allow me to use a tripod. I am planning on bringing a Nikon 70-200 f2.8 also. I will be using a Nikon D800 and D7000. Also, should I use my wife’s D7100 instead of my D7000? It’s hard to say for sure. I know if it were me I’d want the 500mm, but when you’re in a vehicle there is real value to having a zoom. The 80-400 without the TC is pretty good, however, I’m not a huge fan of using it with one. It works, but doesn’t take it as well as I’d personally like. I think your best bet is to try to shoot the 80-400 without the TC as much as possible, switching to the D7100 you mentioned instead of using the TC. Thank you so much for the article. It helps a lot! just a one more question, if you don’t mind, have you tried to combine the TC 1.4 III with a 200 ~ 500 mm lens on your D500? what will the results be in terms of sharpness and AF sensitivity? That seems like a solid decision to me. Thing is, no matter what you do, there will always be times you’ll wish you had gone the other way with lens choice. So, you have to figure out which lens you’ll likely miss the least 🙂 Seems like between the 28-300 and the 150-600 you have it covered nicely. Have a good trip! Steve, as always, another really excellent article..explained in detail, yet in a way that any photographer at any skill level can relate to. Thanks! Thanks Richard 🙂 Good to hear from you!